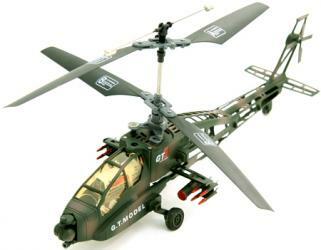 The Apache Helicopter is the most advanced, versatile, deployable, and maintainable multi-role combat helicopter in the world, and now you can be the pilot! 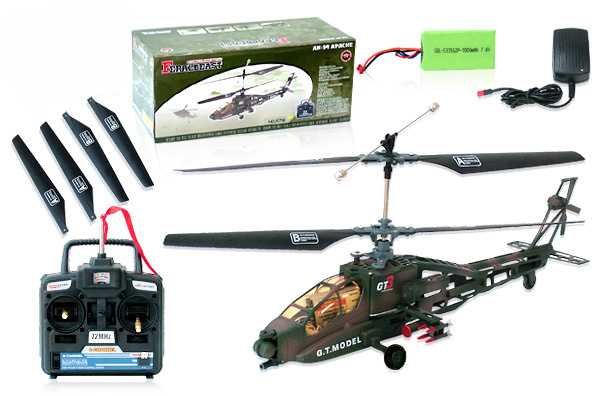 This 4 channel radio controlled AH-64 Apache helicopter gives you complete control of its flight. Full function remote controll forward, backward, up, down, left and right. This RC USA army chopper flies over 30 meters high. 4 channel radio control duel propeller system and stable hover. Up to ten minute flight times with flight range of 60 feet (20 Meters). Factory assembled ready to fly. Requires 8 AA Batteries (not included).